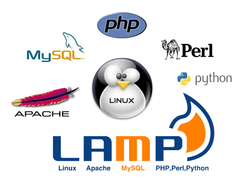 LAMP is the solution stack of free, open source softwares where acronym LAMP refers to the first letters of Linux (operating system), Apache HTTP Server, MySQL (database software) and PHP. So the LAMP development refers to the process of web development where these four tools are in use for achieving the target web application functionality. LAMP stack LAMP is a stack of software that forms the basis of most websites on the Internet. It consists of a Linux distribution, Apache web server, MySQL database management system, and PHP server side scripting language. LAMP stack is widely used for building high-availability heavy-duty dynamic web sites (web application). LAMP is a short for Linux, Apache, MySQL and PHP, an open-source Web development platform, that uses Linux as the operating system. The product made in lamp stack have advantages of powerful web application development and application can be made in low cost with all features. Promatics provides you a result-oriented blend of PHP and MySQL database technology to deliver cost-efficient web applications and systems based on advanced PHP scripting across different versions of Windows as well as Linux servers. MindCrackers Solutions provides its client with the best services in the LAMP development area. We have a great experience in the field of development and thus can help our clients to get the best results.